The publication "Olympia. A Journey in Four Dimensions" is a "digital album" with three-dimensional reconstructions of the most important buildings of ancient Olympia, which are presented with emphasis on historical accuracy and construction details. For the first time the site of ancient Olympia is presented in a book, as it was in its heyday, exclusively through digital pictures. The main part of the book consists of large coloured images of the various monuments of Olympia, as well as general perspectives of the site, the birthplace of the Olympic Games. Architectural monuments and areas that no longer exist in their original form come to life through the use of computers and of three-dimensional graphics programs. The book has been created as part of the activities of the Foundation of the Hellenic World for the Olympic Games that were organized in our country in 2004. At the same time, a series of twelve postal cards has been published with select pictures from this book. 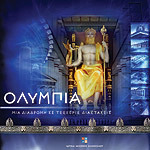 The production of digital reconstructions was done exclusively by the 3D Reconstruction and Animation Department (http://3d.fhw.gr/) of the Foundation of the Hellenic World.